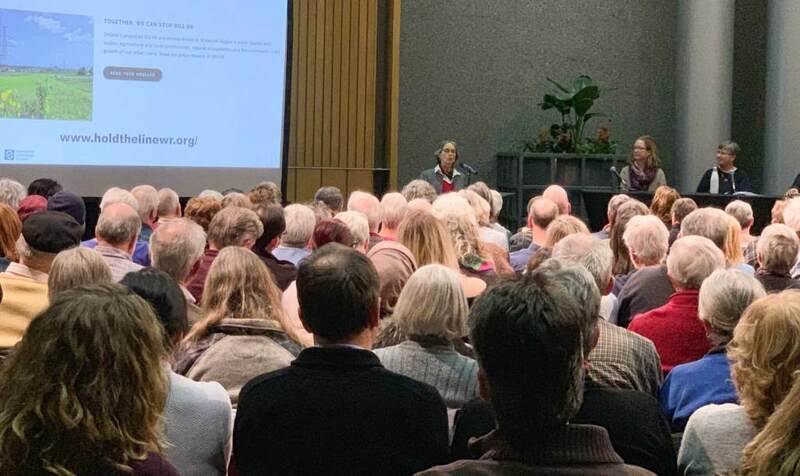 Ontario Environmental Commissioner Dianne Saxe challenged hundreds of concerned residences in Kitchener to speak up about the climate crisis and to protect their children and their future. “Climate change is here now — and it is going to get worse,” Saxe said at an event on Jan. 15 titled, “Steward of Our Future: Protecting What We Love” at the Kitchener city hall. The event was organized by Divest Waterloo, in partnership with Faith and the Common Good, the Centre for Public Ethics at Martin Luther University College, and the Grand River Environmental Network (GREN). There has been a lot of controversies recently regarding Ontario Premier Doug Ford’s proposed Bill 66, also called An Act to Restore Ontario’s Competitiveness, which includes a proposal to close the office of Environmental Commissioner of Ontario (ECO). This office was created by an all-party committee in 1994 as an independent office to hold ministries accountable for their decisions that affect the environment. If the bill is passed in its present form, it will amend several of Ontario’s workplace laws, including legislation put in place to protect Ontario’s waters and green spaces. “Cancellation of green programs hurt 752 clean energy contracts. We need an international lawsuit because we do not own our laws…. Ripping up energy contracts significantly impacts many Indigenous communities in Ontario. We are also actively subsidizing fossil fuel use,” said Saxe. “This is about defending what we love. You do not have to be in a faith community to see that,” said Lucy Cummings, executive director of Faith and the Common Good. Kevin Thomason, vice-chair of GREN, asked the audience to play a role in creating a safer environment and talk to local and provincial officials about the bill and how it could affect them. “We need to stand up and come together now. Local municipalities that have passed a resolution opposing the Bill 66 are the City of Cambridge, the Regional Municipality of Waterloo, the City of Kitchener, the Township of Wellesley and Wilmot Township. Two more municipalities — the Township of Woolwich and the Township of North Dumfries — must still deal with the issue.